Midway through the 2009 baseball season, Pete Incaviglia was passed by Raul Ibanez for most home runs by a player whose last name begins with the letter "I". Inky had 206 lifetime homers, while Ibanez has 216 and counting. Inky's #2 spot is relatively safe, as Brandon Inge is the closest active player behind him with 123 homers. Inky was listed at 6'1" and 225 pounds. Usually, those stats are somewhat inflated, but in this case they seem deflated. I know the picture doesn't show it, but Inky seemed to be more than two inches taller than me. Watching him on tv, I always thought he was even bigger. Maybe it is just my perception. He always just seemed like a big dude. I also didn't realize he played so much outfield as opposed to DH, despite being in the AL for most of his career. He was a DH for only 150 games, as opposed to playing over 1,000 in the outfield. In either case, Incaviglia was a nice guy. There was some confusion over his times and tickets and other stuff, but he still took time to talk to me for a brief bit. We talked about him playing for Philadelphia in the 1993 World Series and later playing in Japan. He had a long and interesting career. 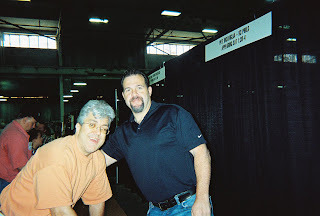 Pete Incaviglia and me in Oaks, PA-October 2009.